Before the feast of Passover, Jesus knew that his hour had come to pass from this world to the Father. He loved his own in the world and he loved them to the end. The devil had already induced Judas, son of Simon the Iscariot, to hand him over. so, during supper, fully aware that the Father had put everything into his power and that he had come from God and was returning to God, he rose from supper and took off his outer garments. He took a towel and tied it around his waist. Then he poured water into a basin and began to wash the disciples' feet and dry them with the towel around his waist. He came to Simon Peter, who said to him, "Master, are you going to wash my feet? : Jesus answered and said to him, "What I am doing, you do not understand now, but you will understand later." Peter said to him, "You will never wash my feet." Jesus answered him, "Unless I wash you, you will have no inheritance with me." Simon Peter said to him, "Master, then not only my feet, but my hands and head as well." Jesus said to him, "Whoever has bathed has no need except to have his feet washed, for he is clean all over; so you are clean, but not all." For he knew who would betray him; for this reason, he said, "Not all of you are clean." How blessed are we to be celebrating this Holy Thursday and the Mass of the Lord's Supper in this Year of the Eucharist. It gives us an opportunity to reflect on the Mass, the Eucharist and the priesthood. We do well remind ourselves of why we come to Mass and what is occurring in the liturgical rites. When we gather for the Mass, which is first and foremost a sacrifice, we are literally re-presenting the bloody sacrifice of Calvary in an unbloody manner. We re-present, we do not re-enact. When we re-present this, we go back in time to the first Calvary - when Christ offered Himself to the Father. This notion of re-presenting a past event was familiar to the Jews, who at this time of the year would re-present the events of the Passover from slavery in Egypt to the journey to the Promised Land led by Moses. As the new Moses, Jesus leads us out of the slavery of sin into the Promised Land of God's kingdom - the possibility of going to heaven is now restored in His death. One of the things that is so remarkable about the sequence of the events of the Last Supper, the first Mass and Good Friday, is that in every other case, in order to have a fruit, you must have a tree that precedes it - that's already there to bear fruit. In the case of the Eucharist, the fruit of the Last Supper - the real presence actually precedes the tree of the Cross. At every Mass, we offer the sacrifice of Calvary back to the Father. 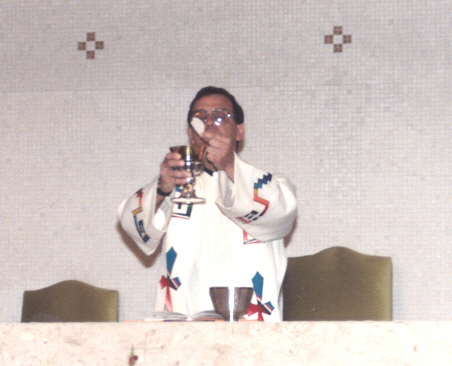 The priest, acting in the person of Christ the head, in persona Christi capitis, says the words of institution and consecrates ordinary bread and wine into the body and blood, soul and divinity of Christ Himself, the same Christ who died for us nearly 2000 years ago, is now sacramentally present. I am always amazed at the faith of second graders, who can so clearly explain what this dynamic is all about. They rarely even have problems saying that fancy theological word, transubstantiation. It's so clear to them. They understand that the God who could easily create the universe by His Word, can even more easily transform bread and wine into His own body and blood - the living food who is Christ Himself. They also know that we consume living food. That's why we're not cannibals - they consume dead flesh. We consume the living, breathing and resurrected Jesus. The Eucharist is a double miracle. It's helpful to consider it in these terms: if I light a piece of paper with a small flame, paper ceases to exist and a new substance, ashes exists. When you change the appearance of a substance, it usually signifies a change in the substance itself. The Eucharist is different: the first miracle is the transubstantiation of bread and wine into the body, blood, soul and divinity of Christ. The second miracle is that even though the stuff or the substance of the bread and wine have been changed into the body and blood of Christ, it still looks like bread and wine, even though nothing of bread and nothing of wine remain. That is so we can consume the sacred species because the normal chain of events is that when I change the substance, I have also changed the appearance of that substance. Not so in the Eucharist - the substance has changed but the appearances never do. That makes the Eucharist consumable - most persons would have difficulty eating cardiac tissue or type AB blood if the appearance of who is really present changed. The manner in which we receive Holy Communion should reflect our belief. it was the custom of the Jews to be fed by their host. The host would literally place the morsel on the tongue of the guest. This is part of the reason why the normative way of receiving Holy Communion is on the tongue. It is the most accurate imitation of how the Apostles themselves would have received the first Eucharist. It is not enough to have reverent external posture for Mass. We must also don appropriate attire for Mass. It is erroneous to say that "God loves me no matter how I look." We should ask, "Does my attire reflect my love for God and consideration for my neighbor who might not be edified by my lack of attention to detail? Does my attire reflect my internal belief that I am receiving supernatural food? Would I dress this way if invited to a State Dinner at the White House, which is only a temporal banquet after all?" Moreover, we ought to come to Mass with a desire to adore, to thank God and to ask Him for His gracious assistance in our lives. When we come to Mass with the mindset of, "what will I get out of it?" we have come to Mass with a consumeristic heart that only sees the value of the Mass if we got something out of it, as if receiving the body, blood, soul and divinity of Christ Himself were not enough! When we examine our readings today, we observe that John's Gospel does not provide us with the narrative of the words of institution of the Eucharist found in the other three Gospels. You don't hear our Lord say the words of consecration in John's Gospel. Actually, the oldest account of the words of institution are from St. Paul's letter to the Corinthians in our second reading. This account is even older than the accounts in Matthew, Mark and Luke. St. John probably didn't include the institution narrative in his account because he was writing in the late 90s, at the end of the first century and there was no need to repeat what was already known to the early Church. Instead, we are given the story of the washing of the feet. It adds another dimension to the Eucharist - service. Just as Jesus is broken and spent for us in the Eucharist, so we are called to be broken and spent for others by making gifts of ourselves to others. This spirit of service, humility and what Christ did for his own may be summed up in the first sentence of today's Gospel, "He loved them to the end." The intensity of Christ's love for us brought Him to lay down His life for us and yet even death can't contain His love, for He rises from the dead in order to continue loving us infinitely. At first, St. Peter has an adverse reaction: He won't allow Jesus to wash his feet. Christ explains that a refusal to accept divine cleansing is to deny intimacy with God. Jesus literally offers us friendship - a share in His divine life. But this friendship has a price and Peter still cannot understand that divine friendship means sacrifice. Once Jesus explains that Peter must allow himself to be purified of his sins, Peter wants his hands and head washed as well, as if to say that both the deeds of his hands and the thoughts of him mind need purifying as well. This is an indication from our Lord that in order to receive Holy Communion worthily, we must be free of mortal sin. O course, the Eucharist does not stand alone. It is intrinsically tied to the other sacrament that our Lord founded on Holy Thursday - the sacrament of Holy Orders. He chose 12 men including Judas, his betrayer, to extend into all time His own ministry. Our Lord knew that it would not be enough to simple leave us his teachings - it was necessary and still is necessary that the faith be given real flesh and blood reality in the person of priests so that our faith doesn't operate in the abstract. The humanity of the priest guarantees that the Father's love never becomes abstract. Priests, acting as alter Christus - other Christ's in the world continue the Father's outreach to the Holy People of God. In their celibacy, priests already witness in their bodies the way that we will all live in heaven, where there is no giving or taking in marriage. What a humbling privilege it is to be a priest - to stand in the person of Christ and to continue his saving work in the world - a dignity not even given to the angels. Even the angels can't consecrate the Eucharist or forgive sins, but a priest can! It should amaze us that God would love man so much that he would chose to share his very work in the world through the hands of priests. It's the middle of February and it is bitterly cold outside. You've gone to be early this evening because you haven't slept for more than six hours in the last three weeks because you've been so busy running around serving God's people. You also know that there is a parishioner dying in the hospital nearby and you're the on-call priest. Sure enough, the phone rings and the son of this dying man tells you to get to the hospital quickly because "it's time." You fumble around in the dark and somehow get yourself into the car and on the road, not remembering how you got dressed or what you even look like. When you arrive at the hospital, you stumble up to the room of the man who is dying and when you arrive on the scene, there is a palpable sigh of relief on the faces of the family as if to say, "Oh, thank God - Father made it." they make room for you to get to the bedside. You console the man's wife and you begin the rites for the dying. As you complete the rites and grant him the Apostolic Pardon, you hold the man's hand and you can literally feel the man's life leave his body, as if he waited for you to get there before he departed from this life. Once the time of death has been established, you console the widow and his children and you quietly leave and return to your car. You look up at the sky and say, "Thank you, Jesus - we got one in today." THAT'S WHY I'M A PRIEST, Fr. Gould told me . . I said, "Ok - sign me up." To close, I'd like to paraphrase what a venerable spiritual director once said about the priesthood: without the priesthood, there would be no Eucharist; without the Eucharist there would be no Church; without the Church there would be no salvation and without salvation there would be no hope. Without hope, there is no God! What gifts we have been given - the Eucharist who is Christ himself and the priesthood which confects and perpetuates it in the Church throughout the ages. O Sacrament most holy, O Sacrament divine, all praise and all thanksgiving, be every moment Thine. And may the heart of Jesus, in the most blessed sacrament of the altar, be praised adored and loved, at every moment, in all the tabernacles of the world, even until the end of time!